Whether you're prepping for dinner or planning a party, this all-purpose recipe for the best meatballs can fit any occasion. Easy to adjust to your tastes and serving size! When I started to learn how to cook, one of the first recipes I tracked down as an all-purpose meatball recipe. And really, can you blame me? When are meatballs not the perfect fit for any situation? They’re one of my main go-to options when I need to whip up something tasty doesn’t require a lot of planning. I’ve made them for appetizers (either on their own or jazzed up with a sauce) and have numerous dinner recipes where meatballs are the showcase. Plus, I love that this recipe can be made with any type of meat, giving you even more freedom to create different tastes with a single recipe. That’s why I consider this to be the best meatball recipe. A freshly baked batch of these meatballs opens up so many options for just a few simple steps! What kind of meat should you use? The idea behind this recipe is to create an all-purpose meatball, so the ingredients are mild enough that they will complement any type of meat. For me, I like to use a 50/50 split of beef and pork, so that is how this recipe is written. However, you can substitute one (or both) of these meats for all beef, all pork, chicken, turkey, or any other type or combination of ground meat. So long as the total amount of meat you use equals two pounds, then you’re good to go. Can you double this recipe? Can you half this recipe? Yes, you totally can (to both questions). This recipe already makes a pretty big batch (48 meatballs), but that might seem a little short for a party or a little big for dinner. I’ve adjusted the serving size of this recipe multiple times with great results, so feel free to make as many (or as little!) as you need. Transfer the baking sheet to the freezer until meatball are frozen. When you’re ready to use the meatballs, let them thaw in the refrigerator overnight. Then you can cook or use them like normal. Is it best to freeze cooked meatballs or raw? This really comes down to personal preference, because freezing cooked or raw meatballs will work just as well. Freezing raw: Since you don’t need to wait for cooking or cooling, this method means there’s less upfront work. So you can make the meatballs, freeze them, then move on to something else. Freezing cooked: While you do have to spend time cooking the meatballs and waiting for them to cool, the cooked meatballs will be tougher and more likely to keep their shapes. Plus, with cooked meatballs, you can add a sauce of your choice to the freezer bag for easy meal planning. How do you make the best meatballs? 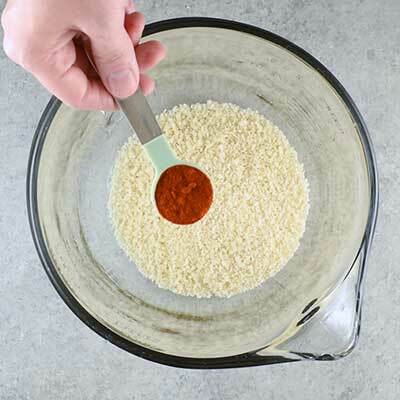 Step 1 – In a large bowl, add some panko breadcrumbs, smoked paprika, chili powder, black pepper, and salt, then mix them until thoroughly combined. Step 2 – Add two pounds of ground meat (I used a 50/50 split of beef and pork, but feel free to use whatever you prefer), beaten eggs, olive oil, and garlic. You can either use a fork to mix the ingredients together or knead it together with your hands. Whichever method you choose, do your best to get the meats mixed, the eggs and oil distributed, and the dry ingredients absorbed. Step 3 – Use a cookie scoop to measure out a meatball size of your choice (standard meatball size is about 1 to 1 1/2 inches in width). Roll the meatball between your hands, taking care to occasionally press the ingredients together; doing this will help the meatball keep its shape. Once finished, place the rolled meatballs on an aluminum foil lined baking sheet. Preheat oven to 350 degrees. Line two baking sheets with aluminum foil, then set aside. 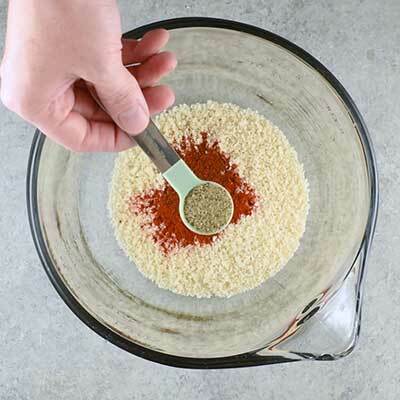 In a large bowl, sift together panko breadcrumbs, smoked paprika, chili powder, salt, and pepper. Add the ground beef, ground pork, egg, olive oil, and garlic to the bowl with the dry ingredients. 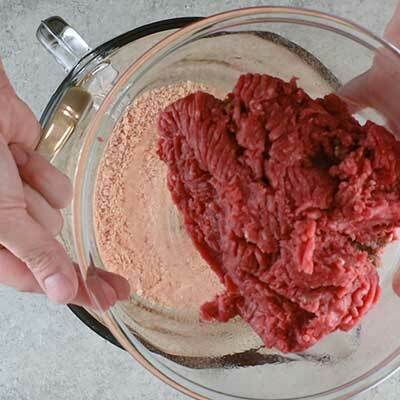 Using a spatula (or even just your hands), mix or kneed the meat into the dry ingredients until thoroughly combined. 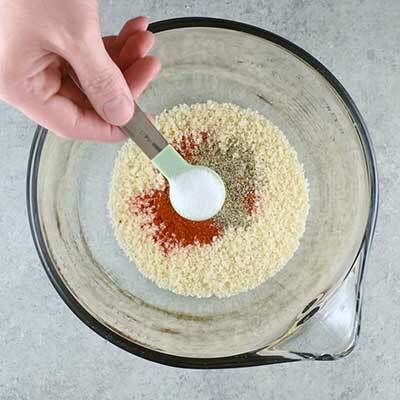 Using a 1 teaspoon cookie scoop (or just pinch off the same amount), scoop out meat mixture and work it with your hands. For best results, gently press the meat as you roll it into a ball. Doing this will help the meatballs keep their shape. 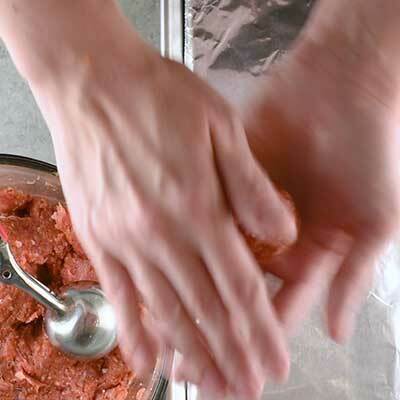 If there are any seams in the meatball, pinch them closed, then roll the meatball between your hands until smooth. Take about 10-20 seconds for each meatball to ensure they're rolled correctly. Once finished, place the meatballs on the prepared baking sheet; it's okay if the meatballs are placed close together, so long as they're not touching. Repeat this step until all the meat mixture has been used. Bake meatballs for 15-20 minutes or until cooked through. Recipe makes about 48 meatballs (1 1/2 inch in width). Don’t you mean store the meatballs in the freezer for 3-4 months, not the refrigerator? Are you sure you mean a tsp. size scoop? I don’t think that would make that size meatball. It looks like you used an ice cream scoop in the pictures. I’m making them today for spaghetti, can’t wait to taste them! Hey Denise! I did make these bigger for the pictures (about 2 tablespoons). But anywhere from 1 teaspoon to 1 tablespoon is the “typical” size that meatballs come in. Feel free to measure them out to any size that you like! Just keep in mind that a bigger meatball may increase cooking time by 5-10 minutes.